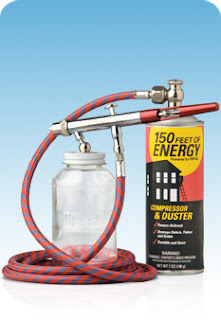 Here is a cool tool that any DIY-er would want to have... a portable paint spray system. Preval has come up with a portable airbrush system using eco-friendly aerosol technology to get professional results! This portable airbrush system is perfect for touching up paint on walls, automotive, moldings, anything that you want to paint! It turns any kind of paint into spray paint! ... or make more broad lines (up to 3 inches tall!) as you see in this video! The Preval's vFan Airbrush system is small and compact so it is easy to use anywhere you need it! It is also light weight so, working in tight spaces is easy too! The vFan Airbrush sprays clear coats, latex, water-based, solvent-based paints, specialty coatings, dyes and stains. Preval's airbursh system is based off of their spray gun... which is also pretty sweet! It can turn any paint into a spray paint can... with not compressor attached. The spray gun has nice controllable mist that comes out to give all your project that professional look! What a neat tool! It would make painting furniture so much easier. Thanks for sharing. Agreed. The vFan portable Airbrush System is the worlds first high-performance hybrid airbrush.